BACKGROUND: Classical fat grafting techniques are relatively difficult to learn and sometimes complications (fat indurations and irregularities) arise as well as unpredictable reabsorption of the transplanted fat. We present an innovative technique of fat grafting which proved to be very useful in combination with orthognatic surgery where maximal reliability and minimal complications are very important. OBJECTIVES: The aim of this study was to show how micro fractured fat transplantation obtained with a new closed disposable device (Lipogems®) applied in combination with orthognatic surgery can obtain very nice surgical outcomes with no complications and minimal postoperative swelling. METHODS: 120 patients undergoing double jaw orthognatic surgery were treated at the end of orthognatic procedure with Lipogems® micro fat grafting technique. Follow up was at 1 day, 1 week, 1, 6 and 12 months. The charts of the patients were reviewed and all the patients re-examined at 12 months by the senior surgeon (M.R.) who scored the quality of results of these series based on his expert opinion. Also a very simple subjective scoring of the patient’s satisfaction of this series was proposed and compared to the past. Concerning the comparison to the past a series of 903 patients from 2001 to 2010 was considered with very similar distribution of main deformity and in which the fat grafting technique was progressively modified and improved. Only the patient subjective assessment of the result is available for these past series and the exact placement and quantity of fat grafting is not always available making meaningful objective comparison difficult. RESULTS: The management of the soft tissue volumes with lipogems micro fat grafting technique allowed satisfactory results with no complications at 12 months follow-up in all 120 patients. Both facial morphology and skin texture were enhanced short and long term by the adjunct of lipogems grafting. More notably, comparing with our previous experience in a similar and larger series of patients using different lipofilling techniques, the immediate postoperative results (1 day and 1 week) showed much less swelling and pain than usual and longer term follow up (1, 6 and 12 months) showed minimal reabsorption and no irregularities or induration. This early reduction in postoperative swelling and pain, although not objectively quantified in this study, was an interesting and unexpected finding which was noted by all caring doctors and nurses. The percentage of “very satisfied” patients was higher in this series compared to the past although the significance of this data as related to the new fat graft procedure is unclear. CONCLUSIONS: Adding transplantation of micro fractured adipose tissue at the end of orthognatic procedure using lipogems technique reduce immediate postoperative pain and swelling and improve final aesthetic outcomes and patient satisfaction with no complications. The surgical technique is much simpler than classical one as micro fat grafts homogeneously fill the subcutaneous tissue avoiding irregularities. 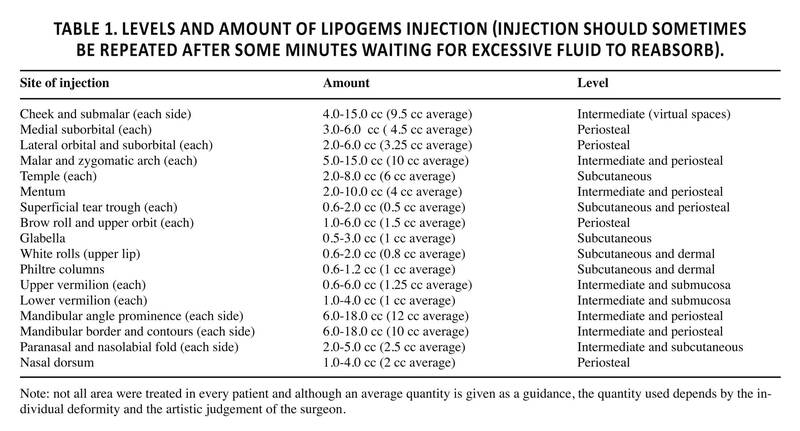 The authors recommends lipogems fat graft technique as a routine adjunct to orthognatic surgery. Beauty in a youthful face consists of fullness, softness, symmetry and proper proportions. When these characteristics are distorted, orthognatic surgery can correct skeletal disharmonies, asymmetries or disproportions, changing the skeletal framework and getting a well-balanced support of the soft tissues but leaving their intrinsic volumes untouched. Sometimes the movements of the hard framework may even worsen the perception of soft tissues volume imbalance. The fat graft procedures to sculpt the soft envelope can aesthetically correct or compensate these deficiencies 1 , 2 , 3 , 4 , 5 , 6 , 7. The auto transplantation of fat grafts is a well-known procedure and different techniques have been proposed in facial aesthetic and reconstructive surgery recontouring 8 , 9 , 10 , 11 , 12 , 13 , 14 , 15 , 16 , 17 , 18; however, structural fat grafting applied together with orthognatic surgery represents a quite new application about which very little had been written 19 , 20 , 21 , 22 , 23 , 24. We began using Coleman’s technique and tools back in 2001 in orthognatic surgery but some drawbacks were soon noted: increased postoperative swelling, unpredictable fat resorption, minor facial contour irregularities, and minor long term asymmetries. For these reasons, despite we considered it a useful technique, we have used it in less than 8% of our patients in the period between 2001 and 2008 (58/728 patients). Starting from 2008, we modified our fat grafting technique using Little and Tonnard protocol 25 , 26 , 27 and later we have incorporated some of Martin’s suggestions 28. These authors proposed several modifications of technique to obtain more predictable results and long-term survival of the grafts: harvesting with small cannulas (2-2.4 mm) with very small holes (0.7-1.0 mm diameter), processing and purifying the material only with washing and cleaning, without centrifugation and injecting with very small, smooth needles (0.7-0.9 mm). This technical improvements appeared to us immediately beneficial both and the fat graft procedure became very often used in combination with orthognatic surgery in our practice using it in about 75% of all procedures until the end of 2010 (131/175 patients). From May 2010 we progressively began to use the new lipogems system which proved to offer an even more standardizable and thus predictable procedure and from January 2011 Lipogems technique has become our procedure of choice 29 and we now present our first two years experience with the first 120 consecutive patients until January 2013 in which lipogems was used in all cases (120/120 patients). In our hands this technique has shown the clinical advantage of a better engraftment, more final smoothness, due to better tissue penetration by the micronized fat graft, and a clear early clinical analgesic and anti-inflammatory action which may be mediated by the MSC endorphin and cytokines release 30 , 31. The inner thigh or the lower and/or lateral abdomen were usually chosen as donor sites for fat graft harvesting keeping in mind also patient’s preferences. 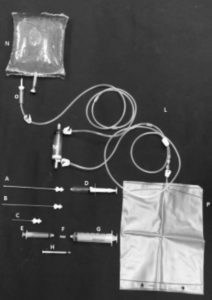 The Lipogems system is provided with all disposable cannulas, syringe and desired device size (60 or 240 cc) included in the kit (Figure 1). Infiltration of subcutaneous tissue is performed with a disposable blunt 19 cm 18G multi micro-holes cannula. Saline mixed with 1:500,000 adrenaline was used injecting about 100 cc for every 10x10x2 cm of subcutaneous tissue and waiting 10 minutes for the haemostasis. Injection of 250 cc solution was enough in all patients of this series in which only the 60 cc device was used. Figure 1. Content of 60 cc kit used for this patients series. All pieces are provided sterile and are disposable single use. Liposuction is performed by a special 10 cc luer lock syringes with progressive aspiration stops connected to a 19 cm 13G aspirating cannula with 5 oval (1×2 mm) holes at the end of the cannula. Its apex is completely blunt to prevent accidental penetration of the abdominal wall or vessel.This special cannula, which is inserted through a 1 mm incision, allows for a very fast and atraumatic harvesting of fat with few cannula strokes maintaining an adequate amount of vacuum pressure by the self-blocking special syringe plunger. The desired quantity of aspirated fat (ideally about 15 cc at a time) was then processed in the 60 cc Lipogems® device which reduces the fat clusters size and wash the tissue from blood, oil and cellular debris (Figure 2). Figure 2. Schematic representation of Lipogems device. Lipogems® is a closed and immersion system. The inlet tube (blue cap) is connected to a saline bag and an outlet tube (grey cap) is connected to a urine waste bag. After making a complete filling with saline removing all air, lipoaspirates are inserted through first filter in the device. The port is completely closed by an automatic valve the transfer of the fat through the first filter create a first volumetric reduction and eliminates fibrotic tissue frustules. 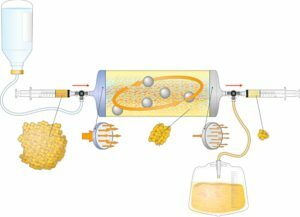 In next step surgeon agitates the system equipped of five stainless steel balls inside which allows oil/physiologic emulsion to be created and washed away by the flux against the gravity in the waste bag. As soon as the adipose tissue appears completely clean a second volumetric reduction of adipocyte cluster through the second filter is performed and final Lipogems® tissue is collected in the syringe. Lipogems® device is a completely closed system. It works using gravity and saline flow avoiding completely air contact with the fat as the system is filled before placing the lipoaspirate. The inlet tube is connected to a saline bag mounted on a stand 1 meter above the working table (1 or 2 Liters bag is recommended for 60 cc Lipogems®). After making a complete filling with saline removing all air, lipoaspirates are inserted through the IN filter in the device (blue cap) after closing the inlet tube with a clamp. The transfer of the fat through the first filter create a first volumetric reduction and traps fibrotic tissue frustules which may be present and which are the main cause of needle clogging when injecting. In next step surgeon manually shakes the device that continues five stainless steel marbles with a movement similar to a bartender. The marbles movements allow oil/physiologic emulsion to be created and washed away by the flux fluid against the gravity. The continuous flow of saline solution effectively eliminates the waste products against gravity in a collection waste bag which is placed below, while the two filters retain adipose clusters in Lipogems® device. As soon as the adipose tissue appears completely clean (yellow) and the saline solution completely transparent, surgeon can perform a second volumetric reduction of adipocyte clusters through the second OUT filter (grey cap) reversing the device (grey cap UP). At the end of processing, about 2 minutes are needed to decant the 10 cc syringes containing the purified micronized adipose tissue which is placed vertically: when the separation line between saline solution and Lipogems is stable, the clear watery solution can be removed obtaining ready to use micronized adipose tissue. Lipogems fat tissue is then usually transferred, by special plastic disposable connector provided in the kit, to 1 cc syringes, which are easier to handle for injections in the face. This is quite different from the classical recommended technique 32. To distribute the fat micro graft the blunt needle was inserted in various areas tangent to the surface, and the material was injected in multiple tissue planes and tunnels but their numbers is much less than in Coleman’s technique since the fat clusters are distributed much better through the soft tissue. This technique in our hands is much less technically demanding and less traumatic than with classical lipofilling technique. Table 1 shows the anatomical sites of injection, the levels of injection, and the amount of injected tissue. This is purely indicative as the quantity used depends strictly by the patients deformity and desire and by the surgeon artistic sense and is often planned intraoperatively. The amount of Lipogems tissue injected depended on the lack of volumes of each site and is generally to inject 2 or 2.5 times more in comparison with the fat transplanted with the classical lipofilling technique or even 3 times more of what you would inject using hyaluronic acid filler. That is due to a higher percentage of liquid component which is rapidly reabsorbed and also to the better distribution within the recipient tissue. It is usually recommended to repeat injections after waiting for fluid reabsorption going back after few minutes for a second injection. The disposable 0.7 mm 7 cm long cannula provided in the kit was used for all subcutaneous sites, though in case of intradermal injection a sharp needle (23G) proved more convenient. 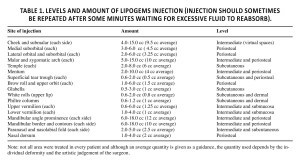 Needle clogging was rarely observed due to the very small fat particles and lack of fibrous part the very fluid nature of Lipogems tissue product allows the use of sharp needle up to 27G in special cases. Periosteal plane means deep injection just over the periosteum. Intermediate plane corresponds to fatty deep virtual spaces (for example: malar fat pad and buccal fat pad) lying under the superficial musculoaponeurotic system, as described by Mendelson 33 , 34 or in the intermuscular or interligamentous virtual spaces. Although it is preferable not to inject inside the muscles to respect the muscular dynamics and to reduce the amount of resorption due to the muscular pump activity, intramuscular injections were less than a problem using Lipogems compared to traditional fat grafts probably for its more fluid nature. Return to normal facial movements was always very fast in less than one week. Superficial plane corresponds to the subcutaneous fat compartments anatomically, as described by Rohrich and Pessa 35 , 36 , 37 , 38 , 39 in their milestone articles. The fluid status of the injected material allows a very safe superficial grafting with ideal distribution with the fine blunt cannula provided and an easy injection of Lipogems tissue with a 23G sharp even in the dermal layers of the labial filtral crest or in the white roll border to accentuate the cupid bow. The lips were also injected intramuscularly and in the oral submucosa level. The postoperative medication for the combined procedure is antibiotics for 1 week, FANS twice a day for 1/2 week, calcium and vitamin D3 for 2 months and vitamin A, E and C for the same time. The diet is liquid for 3 days and then soft for 6 weeks. Medications and diet are related to the orthognatic procedure as lipofilling alone does not require any particular postoperative care or medications when used as an isolated procedure. In an attempt to analysing the results of fat grafting, the investigators defined a simple scale from 1 (poor results) to 4 (ideal) and reported the different areas of injection (mid face contour, neck, mandible contour, lips, chin profile). We are aware that this type of evaluation is observational and very subjective but performed by an expert surgeon (M.R.) who had experience in different fat grafting techniques and no conflict of interest. Unfortunately we are convinced that no objective value can define the improvement of “beauty” and in this case and distinguish what can really be attributed to the main orthognatic surgery and the artistic fat grafting procedure. This is a clear limitation of this study which lacks objective standard parameters to evaluate but this is because such objective parameters simply do not exists when the variables considered are too many and the endpoint is evaluate aesthetic improvement combining different procedures. We also considered the subjective patients opinion on the quality of the overall results as we have always done in the past. A simple scale of 3 levels of value was applied: very satisfied, satisfied, dissatisfied and compared to our previos experience. The studied sample comprised 120 consecutive patients (90 females and 30 males), with an average age of 25.3 years (from 17.4 to 34.4 years old) at the time of surgery. All the surgical procedure were consecutively performed from January 2011 to January 2013. Indications for orthognatic surgery were as follows: 35% (42) for class II deformity, 35% (42) for class III deformity, 17% (20) for asymmetry, 7% (8) for long face deformity and 6% (7) for short face deformity. This classification considers each patient’s main skeletal disorder. The investigators evaluated all patients’ facial appearance after 1 day, 1 week, 1 months, 6 months and 12 months. Nobody was lost to follow up. From the orthognatic point of view, all patients had their deformities corrected to a class I occlusion, normal overbite and overjet, and were functionally and aesthetically improved. The aesthetic results according to the subjective judgment of the investigator as described in the method section were distributed as follows: 49 cases ideal with perfect improvements due to the fat grafts, 46 cases good with evident improvement due to the fat augmentation, 21 cases improved in part as a consequence of the lipofilling volume increase with some residual contour imperfection, 4 not noticeable improving effect due to the lipofilling procedure (Table 2). Moreover, the investigators also evidenced some very positive side effects on the skin texture due to this technique in most patients (98/120). The skin often appeared softer, refreshed and healthier. This effect was noted also subjectively by most patients if asked specifically (79/120 patients responded “yes” to the question: “have you noted an improvement of the skin one year after the operation”). Two considerations were highlighted: while traditional lipofilling procedure combined with orthognatic surgery produced an increase of the postoperative swelling, mainly in the lips and mid face, with Lipogems technique overall swelling is greatly reduced even comparing to isolated skeletal procedure. The bimaxillary orthognatic surgery (Bilateral Sagittal Split Ramus Osteotomy and LeFort I Osteotomy) was normally performed in 60 to 90 minutes, while the harvesting, processing and injecting of Lipogems required an extra of about 15 minutes after all the intraoral incisions had been sutured. The discharge from hospital was only related to orthognatic postoperative morbidity and did not exceed 24 hours in all cases. Tissue irregularities and lumps due to a defective distribution of the fat are very rare (2 cases in the eyelid region) with Lipogems technique and could be very easily corrected by gentle manual massage in the first postoperative month. Long term persistence of irregularities were not seen in our series while they were relatively common when we used classical lipofilling technique expecially in lower eyelids. Moreover, moderate to serious complications described with classic fat graft 40 as chronic oedema, calcification, fibrosis, acne, headache, dysesthesia, drooping, infections, damage of the underlying skeletal structures, cutaneous discolouration or vascular catastrophes were completely avoided when applying this technique but were not seen also in our previous experience. Of course also no major complications such as blindness 41 or tissue necrosis due to embolization occurred. The postoperative inflammatory response was greatly reduced with the Lipogems technique, probably due to the thorough nice purification from oil, blood and cellular debris and possible better viability of micro fat grafts. Patients were also asked their opinion on the quality of the results as we have always done in the past with a simple scale as described in the methods (Table 3). The results were: 95 (79.2%) very satisfied, 23 (19.2%) satisfied and 2 (1.6%) dissatisfied. There is a clear overall increase in “very satisfied” patients comparing with our previous experience with patients who had different lipofilling technique or not fat grafting at all (where this statement was done by 48.8%, 50%, and 1.6% respectively in the past regardless the presence of fat grafting). As we of course consider the orthognatic correction by far the most important procedure, it is hard to understand the reason of a such large increase in patient’s subjective satisfaction. The past series of 903 patients from 2001 to 2010 infact was quite similar (673 females and 230 males), with an average age of 27.3 years (from 15.2 to 44.4 years old) and with similar distribution for the indications for orthognatic surgery (main deformity was: 33% for class II deformity, 41% for class III deformity, 12% for asymmetry, 7% for long face and 7% for short face). Also the type of surgery was similar as all patients underwent LeFort I and Bilateral Sagittal Split Osteotomy (BSSO), and percentage and type of simultaneous adjunctive procedures excluding of course the fat grafting which was significantly lower (31% genioplasty or mandibular border reshaping, 55% rhinoplasty, fat grafting 21% as explained in the introduction). The improved management of the soft tissues volumes with the Lipogems technique allowed more satisfactory results both from the surgeon’s and from the patients’ point of view. Frequently the enhancement of the outcomes was amazing, both for facial volumetric morphology and skin texture (Case 1, 2, 3). A 28 years-old woman with a II class open bite malocclusion with hyper divergent skeletal pattern. 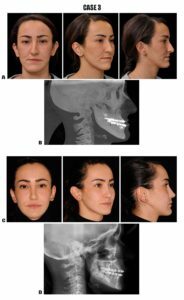 Bimaxillary orthognathic surgery with counter clockwise rotation-advancement combination, sub mental liposuction and lipofilling in malar, nasolabial fold, upper lip, paramandibular lateral areas (Figure 3 AD). Figure 3. A, Preoperative photographs. B, Preoperative tele radiography. C, Postoperative photographs (12 months follow-up). D, Postoperative tele radiography (12 months follow-up). A 44 years-old woman with asymmetric III class with hyper divergent skeletal pattern. 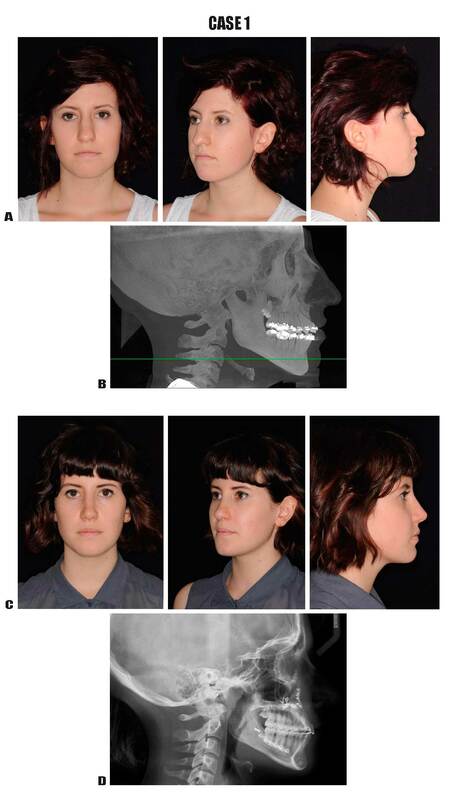 Bimaxillary orthognathic surgery with counter clockwise rotation-advancement combination, canting correction and lipofilling in malar, submalar, nasolabial fold, upper lip (Figure 4 A-D). Figure 4. A, Preoperative photographs. B, Preoperative tele radiography. C, Postoperative photographs (12 months follow-up). D, Postoperative tele radiography (12 months follow-up). 33 years young girl with II class malocclusion and a severe skeletal asymmetry and biretrusion. Bimaxillary rotation advancement with 3D canting correction combined with rhinoplasty and filling of malar, right mandibular angle and border, chin and lips (Figure 5 A- D). Figure 5. A, Preoperative photographs. B, Preoperative tele radiography. C, Postoperative photographs (12 months follow-up). D, Postoperative tele radiography (12 months follow-up). The application of the lipofilling in combination with an orthognathic procedure is quite recent in maxillo facial surgery. The aesthetic results of a traditional orthognatic surgery are frequently unsatisfactory and highlight some volumetric deficiencies or asymmetries affecting the perception of facial contours. To overcome these problems the classical lipofilling procedures proved to be effective in gaining volumes and increasing the quality of the aesthetic outcomes with long lasting results, as assessed in Swanson’s article, in which malar augmentation was documented by MRI 42. In our hand, however, the use of classical fat graft techniques in combination with orthognatic surgery, although useful, was not ideal in many cases with uneven and unpredictable reabsorbtion of fat grafts and increased postoperative morbidity. Coleman’s technique 43 , 44 , 45 , 46 was slightly modified by the authors from 2008 to mid-2010 with better outcome and increased use. Further updating has been taking place since May 2010 when the Lipogems technique was progressively applied and essentially became our standard technique from January 2011 to January 2013 when this series of patients was performed. Adding transplantation of micro fractured adipose tissue at the end of orthognatic procedure using Lipogems technique reduce immediate postoperative pain and swelling and dramatically improve final aesthetic outcomes with no complications. The surgical technique is much simpler than classical one as micro fat grafts homogeneously fill the subcutaneous tissue. The levels of injection and the quantity of the transplanted fat must be chosen according to the different anatomical regions of the face and the individual amount of volumetric deficiency and must be planned intraoperative with artistic skill. Lipogems fat grafting technique appeared to be very important to be able to obtain remarkable and superior aesthetic results than performing skeletal surgery alone or even in comparison with our previous experience using alternative fat graft techniques. In particular, we were able to correct some facial features that were very difficult or impossible to correct by skeletal surgery alone: lips became fuller, more attractive and sexier; the malar prominence augmentation made the mid face more harmonious; the cheek and paranasal fullness reduced the perception of a big nose; mandibular angles, borders and chin lipofilling could compensate for skeletal deficiencies or asymmetries. The maximum benefit of lipogems fat grafting were in class III and asymmetric cases but also class II short and long face were clearly improved despite the quality of bone surgery was clearly more important in these cases. We believe that Lipogems system provides the ideal dimension of the fat clusters (0.3 to 0.9 mm) to transplant and eliminates all excessive oil and inflammatory debris. These features alone proved fundamental to improve clinical outcomes which are further probably helped by active presence of anti-inflammatory cytokines in the micro fragmented adipose tissue 47 , 48 , 49 , 50. All Lipofilling techniques performed together with skeletal orthognatic surgery are generally safe and can improve final aesthetic results in our hands. Lipogems fat grafting technique in our experience had however clear distinctive advantages. The technique of injection of graft is simpler than with classical lipofilling as the small fat clusters perfectly penetrates the recipient tissue and spreads homogeneously avoiding late irregularities. In conclusion, Lipogems microfat grafting technique is safe, simple and very consistent. For this reasons it became our fat graft technique of choice and it is highly recommended to those surgeons who want to get better aesthetic results in their orthognatic practice. We recommend the adjunct of Lipogems fat grafting at the end of every orthognatic procedure as a routine. Mirco Raffaini MD have nothing to disclosure and declared no potential conflicts of interest with respect to the research and publication of this article. Lipogems device were provided free of charge by Lipogems International for this study. Duskova M, Kristen M. Augmentation by autologous adipose tissue in cleft lip and nose. Final esthetic touches in clefts: part I. J Craniofac Surg 2004; 15(3): 478-481; discussion 82. Coleman SR. Structural fat grafting: more than a permanent filler. Plast Reconstr Surg 2006; 118(3 Suppl): 108S-120S. Domergue S, Psomas C, Yachouh J, Lesnik A, Reynes J, Goudot P, et al. Fat microinfiltration autografting for facial restructuring in HIV patients. J Craniomaxillofac Surg 2006; 34(8): 484-488. Guyuron B, Majzoub RK. 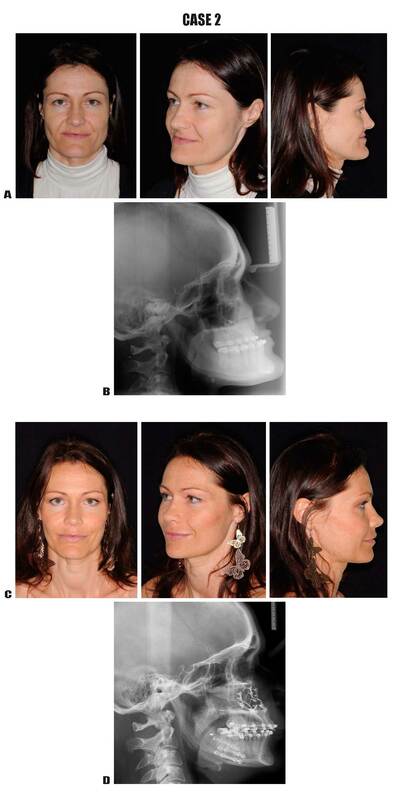 Facial augmentation with core fat graft: a preliminary report. Plast Reconstr Surg 2007; 120(1): 295-302. Guijarro-Martinez R, Miragall Alba L, Marques Mateo M, Puche Torres M, Pascual Gil JV. Autologous fat transfer to the cranio-maxillofacial region: updates and controversies. J Craniomaxillofac Surg 2011; 39(5): 359-363. Swanson E. Malar augmentation assessed by magnetic resonance imaging in patients after face lift and fat injection. Plast Reconstr Surg 2011; 127(5): 2057-2065. Botti G, Pascali M, Botti C, Bodog F, Cervelli V. A clinical trial in facial fat grafting: filtered and washed versus centrifuged fat. Plast Reconstr Surg 2011; 127(6): 2464-2473. Fulton JE Jr. Breast contouring by autologous fat transfer. Am J Cosmetic Surg 1992. Coleman SR. Facial recontouring with lipostructure. Clin Plast Surg 1997; 24(2): 347-367. Coleman SR. Long-term survival of fat transplants: controlled demonstrations. Aesthetic Plast Surg 1995; 19(5): 421-425. Coleman SR, Saboeiro AP. Fat grafting to the breast revisited: safety and efficacy. Plast Reconstr Surg 2007; 119(3): 775-785; discussion 86-87. Yoshimura K, Sato K, Aoi N, Kurita M, Hirohi T, Harii K. Cell-assisted lipotransfer for cosmetic breast augmentation: supportive use of adipose-derived stem/stromal cells. Aesthetic Plast Surg 2008; 32(1): 48-55; discussion 6-7. Illouz YG, Sterodimas A. Autologous fat transplantation to the breast: a personal technique with 25 years of experience. Aesthetic Plast Surg 2009; 33(5): 706-715. Coleman SR. Fat injection from filling to regeneration. Quality Medical Publishing, Inc St. Louis Missouri, 2009. Meier JD, Glasgold RA, Glasgold MJ. Autologous fat grafting: long-term evidence of its efficacy in midfacial rejuvenation. Arch Facial Plast Surg 2009; 11(1): 24-28. Xie Y, Zheng DN, Li QF, Gu B, Liu K, Shen GX, Pu LL. An integrated fat grafting. Technique for cosmetic facial contouring. J. Plast. Reconstr Aesth Surg 2010; 63: 270-276. Cortese A, Savastano G, Felicetta L. Free fat transplantation for facial tissue augmentation. J Oral Maxillofac Surg 2000; 58(2): 164-169; discussion 9-70. Clauser L. In: Coleman S, Mazzola RF. Fat injection from filling to regeneration. Chap 18. Quality Medical Publishing Inc., St. Louis Missouri, 2010. Nocini PF, Chiarini L, Bertossi D. Cosmetic procedures in orthognathic surgery. J Oral Maxillofac Surg 2011; 69(3): 716-723. Karacalar A, Orak I, Kaplan S, Yildirim S. No-touch technique for autologous fat harvesting. Aesthetic Plast Surg 2004; 28(3): 158-164. Tzikas TL. Lipografting: autologous fat grafting for total facial rejuvenation. Facial Plast Surg 2004; 20(2): 135-143. Little JW. Course “Sculptural Rejuvenation of the face”. The Aesthetic meeting, New York, 2007. Tonnard P, Verpaele AM. Short-scar face lift.operative strategies and techniques. Quality Medical Publishing Inc., St Louis Missouri, 2007. Tremolada C, Palmieri G, Ricordi C. Adipocyte transplantation and stem cells: plastic surgery meets regenerative medicine. Cell Transplant 2010; 19(10): 1217-1223. Blaber SP, Webster RA, Hill CJ, Breen EJ, Kuah D, Vesey G, et al. Analysis of in vitro secretion profiles from adipose-derived cell populations. J Transl Med 2012; 10: 172. Murphy MB, Moncivais K, Caplan AI. Mesenchymal stem cells: environmentally responsive therapeutics for regenerative medicine. Exp Mol Med 2013; 45: e54. Mendelson BC, Muzaffar AR, Adams WP, Jr. Surgical anatomy of the midcheek and malar mounds. Plast Reconstr Surg 2002; 110(3): 885-896; discussion 97-911. Mendelson BC, Freeman ME, Wu W, Huggins RJ. Surgical anatomy of the lower face: the premasseter space, the jowl, and the labiomandibular fold. Aesthetic Plast Surg 2008; 32(2): 185-195. Rohrich RJ, Pessa JE. The fat compartments of the face: anatomy and clinical implications for cosmetic surgery. Plast Reconstr Surg 2007; 119(7): 2219-2227; discussion 28-31. Rohrich RJ, Pessa JE. The retaining system of the face: histologic evaluation of the septal boundaries of the subcutaneous fat compartments. Plast Reconstr Surg 2008; 121(5): 1804-1809. Rohrich RJ, Pessa JE, Ristow B. The youthful cheek and the deep medial fat compartment. Plast Reconstr Surg 2008; 121(6): 2107-2112. Rohrich RJ, Pessa JE. The anatomy and clinical implications of perioral submuscular fat. Plast Reconstr Surg 2009; 124(1): 266-271. Rohrich RJ, Ahmad J, Hamawy AH, Pessa JE. Is intraorbital fat extraorbital? Results of cross-sectional anatomy of the lower eyelid fat pads. Aesthet Surg J 2009; 29(3): 189-193. Lee SK, Kim DW, Dhong ES, Park SH, Yoon ES. Facial Soft Tissue Augmentation using Autologous Fat Mixed with Stromal Vascular Fraction. Arch Plast Surg 2012; 39(5): 534-539. Agostini T, Lazzeri D, Pini A, Marino G, Li Quattrini A, Bani D, et al. Wet and dry techniques for structural fat graft harvesting: histomorphometric and cell viability assessments of lipoaspirated samples. Plast Reconstr Surg 2012; 130(2): 331e-9e. Cook T, Nakra T, Shorr N, Douglas RS. Facial recontouring with autogenous fat. Facial Plast Surg 2004; 20(2): 145-147. Ozsoy Z, Kul Z, Bilir A. The role of cannula diameter in improved adipocyte viability: a quantitative analysis. Aesthet Surg J 2006; 26(3): 287-289. Bianchi F, Maioli M, Leonardi E, Olivi E, Pasquinelli G, Valente S, et al. A new nonenzymatic method and device to obtain a fat tissue derivative highly enriched in pericyte-like elements by mild mechanical forces from human lipoaspirates. Cell Transplant 2013; 22(11): 2063-2077. Gutowski KA, Force AFGT. Current applications and safety of autologous fat grafts: a report of the ASPS fat graft task force. Plast Reconstr Surg 2009; 124(1): 272-280. Maioli M, Rinaldi S, Santaniello S, Castagna A, Pigliaru G, Delitala A, Bianchi F, Tremolada C, Fontani V, Ventura C. Radio electric asymmetric conveyed fields and human adipose-derived stem cells obtained with a non-enzymatic method and device: a novel approach to multipotency. Cell Transplant 2013 Aug 30 [Epub ahead of print].